The Yeppoon Lagoon is the jewel in the crown of the Yeppoon foreshore precinct. The 2500 square-metre resort style lagoon pool is located right on the beach front and includes a shallow children’s play area, an informal lap swimming area and a swim-up infinity edge with stunning views over the Keppel Islands. The surrounding parklands include barbecues and shades areas great for picnics or a relaxing way to while away an afternoon with stunning views under the tropical foliage. Entry to the Lagoon is free and is patrolled Monday to Sunday including Public Holidays. 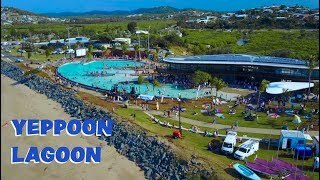 The Yeppoon Lagoon is located right in the heart of Yeppoon and just minutes from luxury beach front accommodation, gourmet dining and a thriving retail precinct, so why not come and experience all the Capricorn Coast has to offer.